Hard work is supposed to pay, right? Well, it didn’t for Jon Ozols. 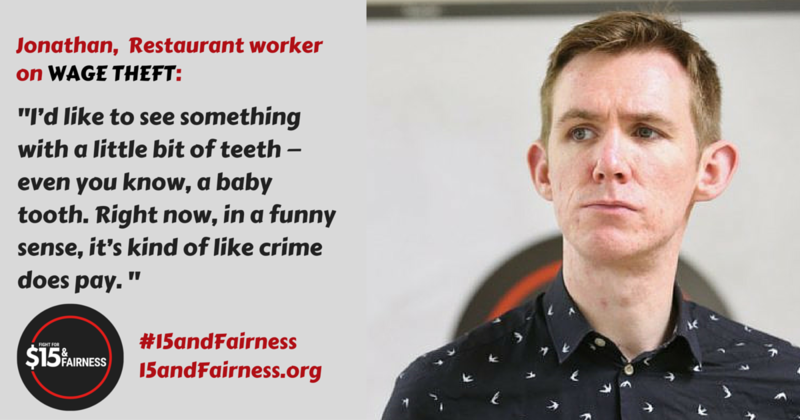 Jon, a WAC member, was working in a restaurant in downtown Toronto when he realized he wasn’t being paid fairly. He was making the student minimum wage, even though he wasn’t one. When Jon stood up for his rights he got fired. His boss made it clear that she had no intention of paying the $878.96 he was entitled to and tried to intimidate him with threats of legal action. Determined to get justice, Jon fought back. He filed a claim with the Ministry of Labour and was hopeful that this case of wage-theft would not go unpunished. He knew his rights as a worker, and believed the government would step in and offer protection. What he didn’t anticipate was having to borrow money from friends to cover rent. It took nearly nine months for the ministry to confirm his claim, and an additional three years to get his wages. Jon isn’t alone. Since 2009, the Ministry of Labour has NOT been able to collect $28 million out of $47.5 million stolen from workers. Meanwhile, less than 0.2% of bosses found guilty have been prosecuted. After “winning” his claim at the Ministry, but still not seeing a single cent of the money he was owed for two years, Jon spoke to the Toronto Star. Overlooking his boss’ threats, he shared his story publicly to warn other workers and expose the lack of enforcement. Last month, a week after the third time Toronto Star reported on Jon’s story, he finally received his wages. Jon is incredibly happy that he won, however having to wait 4 years to get his badly needed wages is unacceptable. He is now more determined than ever to ensure stronger enforcement of our labour laws so that no one has to experience what he went through. Jon, like many others, wants to see proactive enforcement and real consequences for bosses who break the law. We are inspired by Jon’s determination and bravery. He is an incredible Workers’ Action Centre leader who is fighting for a $15 minimum wage and fair working conditions. The Ontario government is currently reviewing all our labour laws and now is the perfect time for all of us to raise our voices. Join us on Saturday October 1st at Queen’s Park to call on our elected officials to ensure decent work for all. Bring your family and friends – we’re meeting at 12:00 pm (noon) at the Northwest corner of University Avenue and College Street, click here to RSVP and share on Facebook.